‘No free labor’ – we agree. Well, this is interesting. At Cambridge we have been trying to look at this specific issue since late last year. Our goal was to have a better understanding of the interaction between publisher and researcher. The (not very imaginatively named) Data Gathering Project is a project to support the decision making of the Journal Coordination Scheme in relation to subscription to, and use of, academic journal literature across Cambridge. What we have initially found is that the data is remarkably difficult to put together. Cambridge University does not use bibliometrics as a means of measuring our researchers, so we do not subscribe to SciVal, but we have access to Scopus. But Scopus does not pick up Arts and Humanities publications particularly well, so it will always be a subset of the whole. Some information that we thought would be helpful simply isn’t. We do have an institutional Altmetric account, so we were able to pull a report from Altmetric of every paper with a Cambridge author held in that database. But Altmetric does not give a publisher view – we would have to extract this using doi prefixes or some other system. Cambridge uses Symplectic Elements to record publications from which, for very complicated reasons, we are unable to obtain a list of publishers with whom we publish. As part of the subscription we have access to the new analysing product, Dimensions. However, as far as we have managed to see, Dimensions does not break down by publisher (it works at the more granular level of journal), and seems to consider anything that is in the open domain (regardless of licence) to be ‘open access’. So figures generated here come with a heavy caveat. We are also able to access the COUNTER usage statistics for our journals with the help of the Library eresources team. However these include downloads for backfiles and for open access articles, so the numbers are slightly inflated, making a ‘cost per download’ analysis of value against subscription cost inaccurate. We know how much we spend on subscriptions (spoiler alert: a lot). We need to take into consideration our offsetting arrangements with some publishers – something we are taking an active look at currently anyway. So to supplement the aggregated information we have to hand, we have reached out to those publishers our researchers publish with in significant quantities to ask them for the following data on Cambridge authors: Peer Reviewing, Publishing, Citing, Editing, and Downloading. This is exactly what the University of California is demanding. One of the reasons we need to ask publishers for peer review information is because it is basically hidden work. Aggregating systems like Publons do help a bit, although the Cambridge count of reviewers in the system is only 492 which is only a small percentage of the whole. Publons was bought out by Clarivate Analytics (which was Thompson Reuters before this and ISI before that) a year ago. We did approach Clarivate Analytics for some data about our peer reviewing, but declined to pay the eye watering quoted fee. Contrary to our assumptions, many of the publishers responded saying that this information is difficult to compile because it is held on different systems and that multiple people would need to be contacted. Sometimes this is because publishers are responsible for the publication of learned society journals so information is not stored centrally. They also fed back that much of the data is not readily available in a digestible format. Some publishers have responded with data on Cambridge peer reviewers and editors, usage statistics, and citation information. A big thank you to Emerald, SAGE, Wiley, the Royal Society and eLife. We are in active correspondence with Hindawi and PLOS. [STOP PRESS: SpringerNature provided their data 30 minutes after this blog went live, so thanks to them as well]. However, a number of publishers have not responded to our requests and one in particular would like to have a meeting with us before releasing any information. The brief for the project was to ‘understand how our researchers interact with the literature’. While we wrote the brief ourselves, we have come to realise it is actually very vague. We have tried to gather any data we can to start answering this question. What the data we have so far is helping us understand is how much is being spent on APCs outside the central management of the Office of Scholarly Communication (OSC). The OSC manages the block grants from the RCUK (now UKRI) and the Charities Open Access Fund, but does not look after payments for open access for research funded by, say the Bill and Melinda Gates Foundation or the NIH. This means that there is a not insignificant amount of extra expenditure on top of that coordinated by the OSC. These amounts are extremely difficult to ascertain as observed in 2014. We already collect and report on how much the Office of Scholarly Communication has spent on APCs since 2013. However some prepayment deals makes the data difficult to analyse because of the way the information is presented to us. For example, Cambridge began using the Wiley Dashboard in the middle of the year with the first claim against it on 6 July 2016, so information after that date is fuzzy. The other issue with comparing how much a publisher has received in APCs and how much the OSC has paid (to determine the difference) is dates. We have already talked at length about date problems in this space. But here the issue is publisher provided numbers are based on calendar years. Our reporting years differ – RCUK reports from April to March and COAF from October to September, so pulling this information together is difficult. Our current approach to understanding the complete expenditure on APCs, apart from analysing the data being provided by (some) publishers, is to establish all of the suppliers to whom the OSC has paid an APC and obtain the supplier number. This list of supplier numbers can then be run against the whole University to identify payments outside the OSC. This project is far from straightforward. Every dataset we have will require some enhancement. We have published a short sister post on what we have learned so far about organising data for analysis. But we are hoping over the next couple of months to start getting a much clearer idea of what Cambridge is contributing into the system – in terms of papers, peer review and editorial work in addition to our subscriptions and APCs. We need more evidence based decision making for negotiation. The Call to Action is by the University of California’s Systemwide Library and Scholarly Information Advisory Committee, UCOLASC, and the UC Council of University Librarians, who: “seek to engage the entire UC academic community, and indeed all stakeholders in the scholarly communication enterprise, in this journey of transformation”. The Open Access policies developed and applied by the UK’s major research funders (HEFCE, RCUK and COAF) all aim to achieve one thing: freedom of knowledge for all. However, the specific mechanisms these funders have taken to achieve this goal varies considerably and requires careful implementation from higher education institutions (HEIs). In this blog post, I’ll describe the different workflows required to meet each funder’s expectations and then look at how these policies intersect with each other to form a tangled web of policy nightmare. Some of the decisions and processes will be peculiar to the University of Cambridge, especially when it comes to decisions around funding for article processing charges (APCs), but the general approach will be true of most UK HEIs. At the outset, let’s be clear: the HEFCE Open Access policy applies to all researchers working at all UK HEIs. If an HEI wants to submit a journal article for consideration in REF 2021 the article must appear in an Open Access repository (although there is a long list of exceptions). 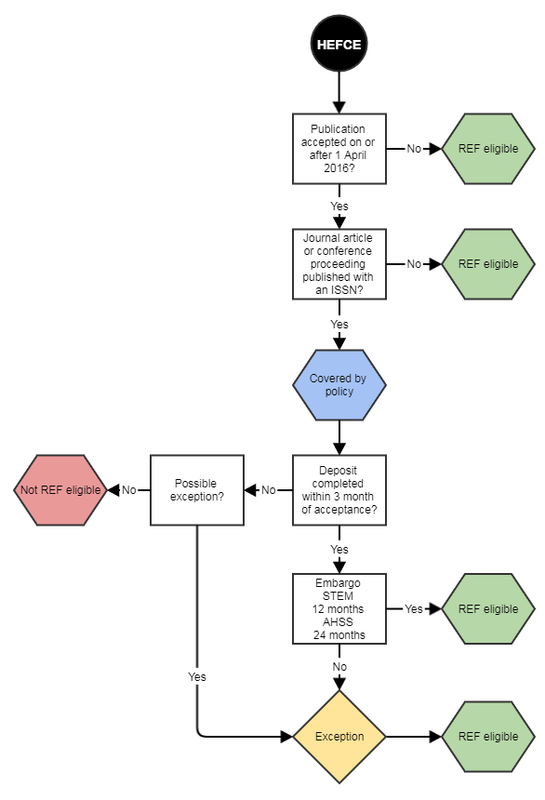 Keen observers will note that in the above flowchart HEFCE’s policy is enforced based on deposit within three months of acceptance. This requirement has caused significant consternation amongst researchers and administrators alike; however, during the first two years of the policy (i.e. until 31 March 2018) publications deposited within three months of publication will still be eligible for the REF. At Cambridge, we have been recording manuscript deposits that meet this criterion as exceptions to the policy. Next up, the RCUK Open Access policy. This policy is straightforward to implement, the only complication being payment of APCs, which is contingent on sufficient block grant funding. Otherwise, the choice for authors is usually quite obvious: does the journal have a compliant embargo? No? Then pay for immediate open access. One extra feature of the RCUK Open Access policy not captured here is the Europe PMC deposit requirement for MRC and BBSRC funded papers. Helpfully, the policy document makes no mention of this requirement; rather, this feature of the policy appears in the accompanying FAQs. I’m not expert, but this seems like the wrong way to write policies. Finally, we have the COAF policy, possibly the single most complicated OA policy to enforce anywhere in the world. The most challenging part of the COAF policy is the Europe PMC deposit requirement. It is often difficult to know whether a journal will indeed deposit the paper in Europe PMC, and if, for whatever reason, the publisher doesn’t immediately deposit the paper, it can take months of back-and-forth with editors, journal managers and publishing assistants to complete the deposit. This is an extremely burdensome process, though the blame should be laid squarely at the publishers. How hard is it to update a PMC record? Does it really take two months to update the Creative Commons licence? This leads us to one of the more unusual parts of the COAF policy: publications are considered journals if they are indexed in Medline. That means we will occasionally receive book chapters that need to meet the journal OA policy. Most publishers are unwilling to make such publications OA in line with COAF’s journal requirements so they are usually non-compliant. This flowchart, despite its length, still doesn’t capture every possible policy outcome and is missing several nuances related to the payment of APCs, but nonetheless, it gives an idea of the enormous complexity that underlies the decision making process behind every article deposited in Apollo and in other repositories across the UK. Within the University’s CRIS, Symplectic Elements, only one date range is possible so we have chosen to monitor compliance from the acceptance date. Publications deposited within the ‘transitional’ three months from publication window receive an ‘Other’ exception within Elements that contains a short note to this effect.